If post-European colonization Australian has any sort of religion, there’s a good argument to be made that it could be the indigenous code of football, known as Australian Rules. For most Australians in the southern part of the country, footy provides them with the closest opportunity they will have to a tribal allegiance and generally loyalties toward their team are fervent and frequently location based even now (and almost exclusively the further you go back into the past). The Australian Football League (AFL), administer of the sport, to this day tries to spread the Aussie footy message overseas, but the reality is that the game remains local. Nonetheless, its impact on Australians is undeniable, with millions viewing games every week, either at stadiums or on television, and its influence on society is pervasive, even in the northern states of New South Wales and Queensland, where forms of rugby have traditionally been the favorite football codes. It was part of the effort to spread the charm of Australian football overseas that Japan became involved. Australian football garnered a modicum of appeal in the United States through screenings on the ESPN sports cable channel. From there interest arose from Japan’s Fuji TV, then flush with funds from the country’s bubbling economy and its series of phenomenally successful “trendy drama” shows with sky-high ratings bringing in almost boundless advertising revenue. 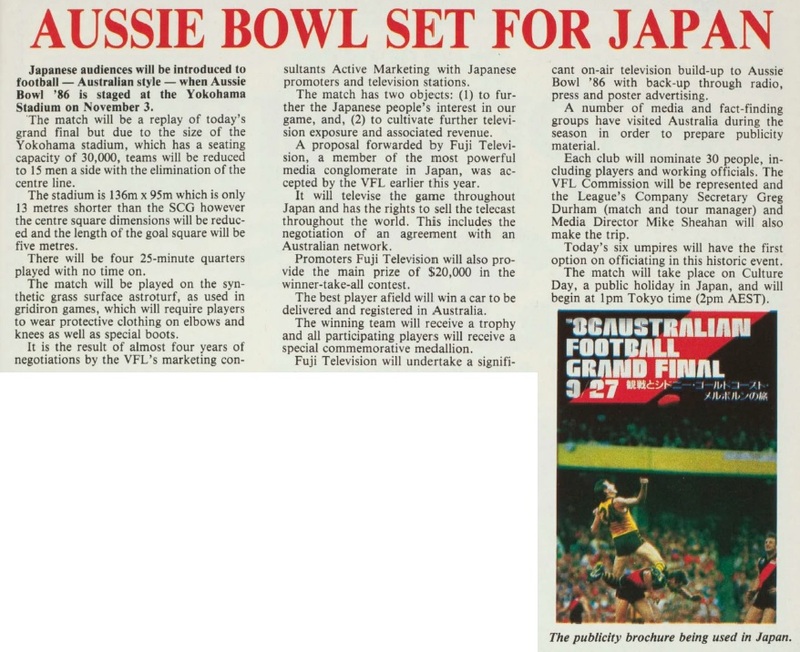 Ironically, on May 20, 1986, just as the Victorian Football League (the AFL’s predecessor) was poised to announce that its Melbourne-based game was to expand to encompass teams from Western Australia and Queensland, there also came the announcement of the “Aussie Bowl,” an Australian Rules game to be played at Yokohama Stadium by that year’s grand finalists. Fuji TV had proposed the game and would bankroll it, providing the winning team with $20,000 and the best player with a new car. Total costs estimated at AUD$2 million would be borne by Fuji in exchange for global broadcast rights. The game would be played as 15-a-side, three players fewer than normal due to the diamond-shape stadium instead of the oval ground the game is usually played on. Fuji promoted the game heavily, running special features in magazines and manga associated with its media network and tickets sold like “tempura hot cakes,” according to one Australian commentator at the time. J-Walk, then an up-and-coming band, released the single Hono no Senshi (炎の戦士) to promote the game and it became a minor hit. Aussie Rules was on the verge of becoming Japan’s flavor of the month just as the country’s newlyweds were also starting to fall in love with Down Under. Nov. 3, 1986, duly rolled around. Culture Day in Japan, a national holiday, and good enough for a crowd of about 25,000 to roll up and watch the VFL Premiers Hawthorn Hawks continue their Grand Final dominance over the Carlton Blues, winning 22.17 (149) to 13.18 (96). The ground announcer was Ichiro Furutachi. By all accounts, the game was a success. 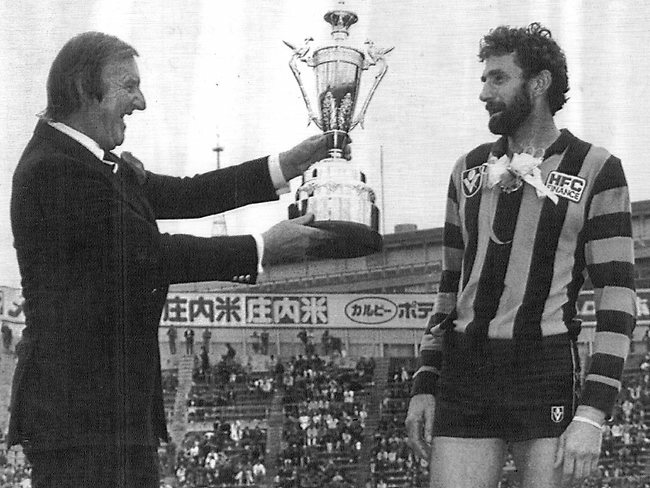 Robert Dipierdomenico would be voted player of the match and Aussie Rules was helping Australia gain a foothold in the affections of ordinary Japanese, joining koalas and frill-necked lizards as a symbol of the land Down Under. Plans for Aussie Bowl ‘87 started immediately. The pattern was similar: that year’s Grand Finalists would meet later in Yokohama, a huge crowd would attend and Fuji and the VFL/AFL would make a killing. That was the plan, but things didn’t quite work out that way. 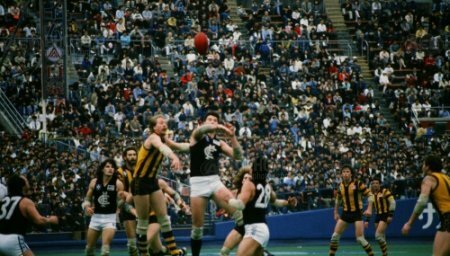 Many players from Carlton had apparently been reluctant participants in the 1986 game, which came some six weeks after they had been defeated in the Grand Final and had hoped to be on holiday. 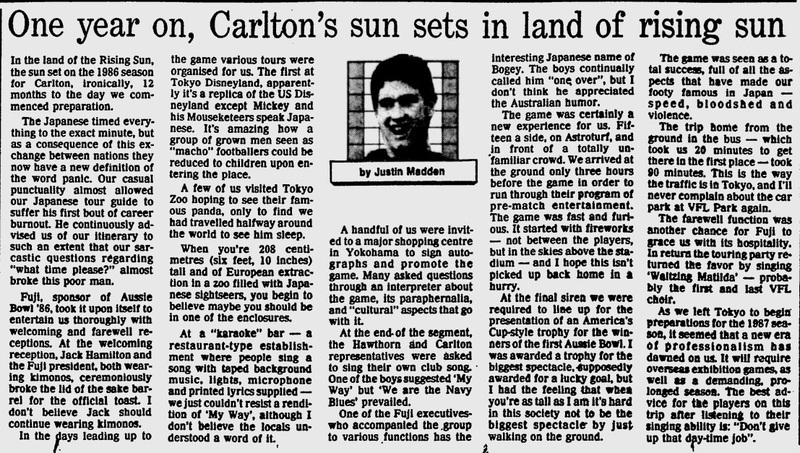 There had, as hinted at in a much-later column from then Carlton star and future Victorian State Government Cabinet Minister Justin Madden, been some minor cultural clashes between the “easygoing” Aussies and “time obsessed” Japanese. 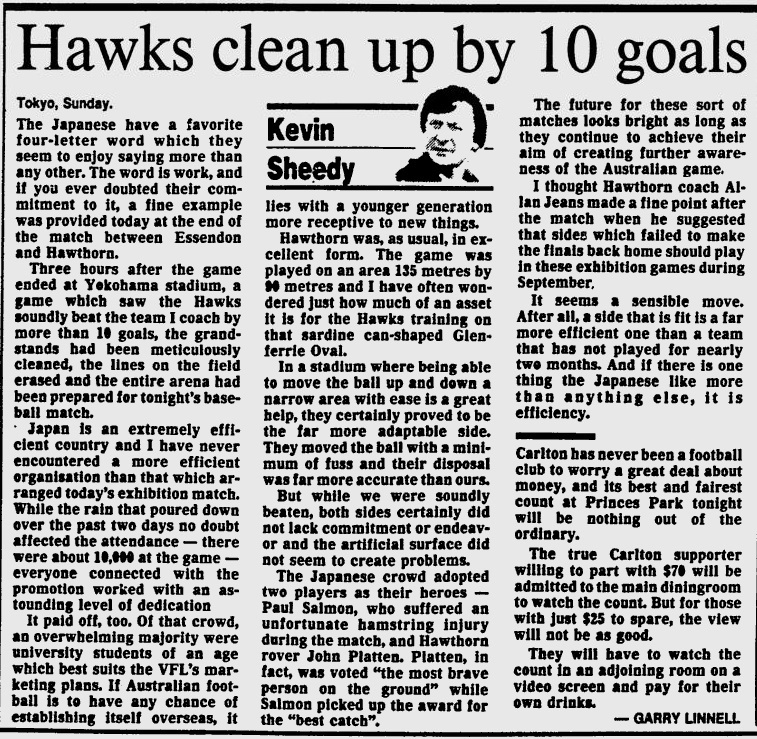 Even though the Japan match was moved back a week to accommodate the players’ post-season vacation plans and then Carlton President John Elliott made threats against reluctant participants, the Blues qualified by making the 1987 Grand Final (again against Hawthorn) but by then had already pulled out and been replaced by the Essendon Bombers, the Hawks’ other great rivals of the 1980s. A typhoon swept over the Kanto Region in the days leading up to the Oct. 25 match. In the two days before the game, Yokohama had been pounded by torrential rain. Prices for the match were also steep, more than double the cost of a Grand Final ticket and about four times what it would normally cost to watch a game of baseball at the same stadium. Regardless of Japan being awash with cash, the previous year’s novelty appeal had not been maintained despite the game being plugged by Romancing Yard, a theme song by Chage & ASKA, at the time one of Japan’s biggest acts. Only about 13,000 turned up to watch, many of whom were left wondering whether Essendon had turned up to play as the Hawks flogged the Bombers by about 10 goals (nobody is quite sure what the actual final score was). It seemed Aussie Rules would continue to try and cultivate the Japanese market, which then appeared poised to become the world’s largest. Suntory Ltd., one of Japan’s largest brewers, would use Aussie Rules and Mark “Jacko” Jackson to promote its beers. But, around about that time, the bean counters stepped in. Fuji found financing Aussie Rules to be unsustainable, even in an age when it was the norm to throw money around on losing causes. The VFL wouldn’t or couldn’t continue to pay the cost of promoting the Australian game in Japan. And that was just about that. That’s not to say there wasn’t a legacy. For Aussie Bowl ’87, two university teams formed to play a curtain raiser to the main clash. From that, a Japanese Aussie Rules league formed, centered on university students. 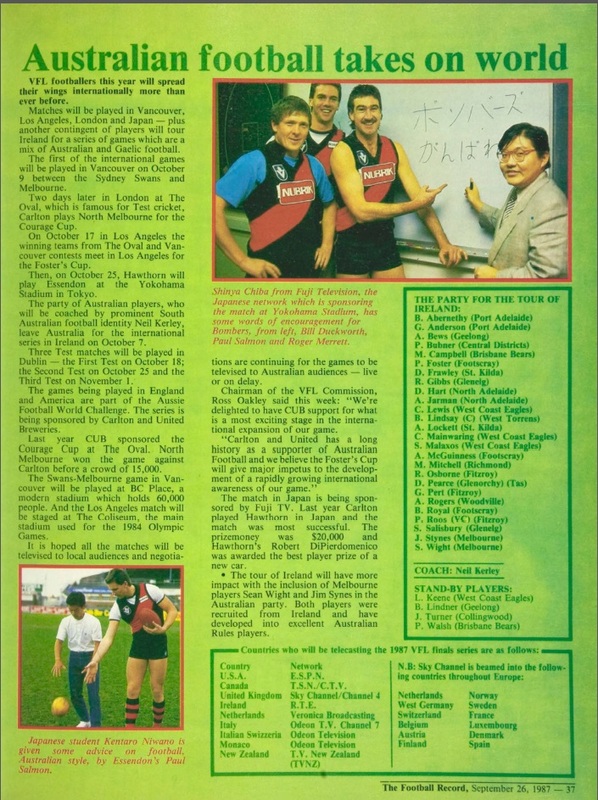 The league, the Australian Football League Japan, remains to this day. It also forms the basis for the Japan Samurais, the team that competes in the International Cup. The league grows yearly on a tiny base, but it looks great! It has even contributed a player who vied for selection in high-ranked Australian football leagues beneath the national league almost a decade ago. Ichiro Furudate, the ground announcer for Aussie Bowl ’86, remains a nightly presence on Japanese TV as the anchor for TV Asahi’s News Station. 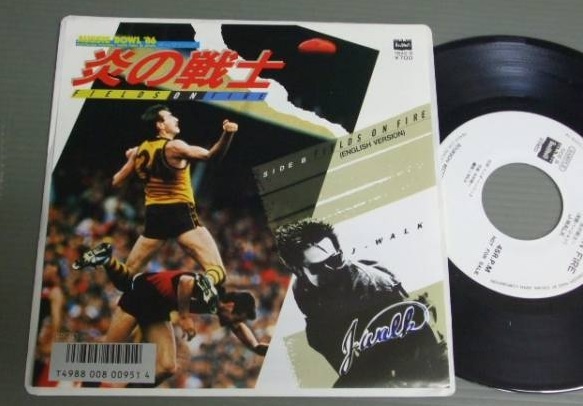 Koichi Nakamura, lead vocalist and the face of J-Walk, which had done the theme for Aussie Bowl ’86 would see his career in tatters following multiple convictions for drug possession and a term behind bars. Mirroring that was a drug conviction for Aska from the Aussie Bowl ’87 theme song performers, Chage and Aska. Roles the performers had played in proselytizing Aussie Rules were long forgotten. Perhaps the closest Japan has come to having a role to play in contemporary Aussie Rules was Essendon visiting for a Buddhism-inspired pre-season trip in 2006. Or, perhaps even more recently, there was former bad boy Brendon Fevola tattooing his wife’s name on his arm in katakana script. But even Fevola has been off the AFL scene for a five years now. 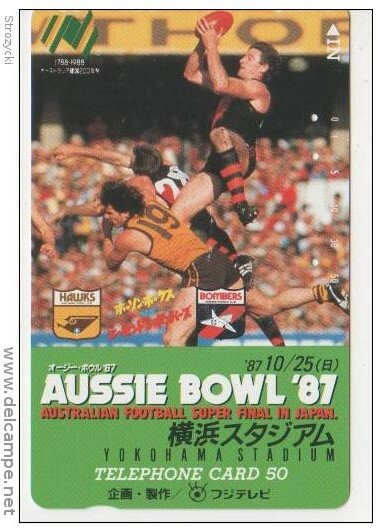 But the halcyon days of Aussie Rules given prime-time airtime in Japan are now decades in the past and unlikely to ever arise again.